Ride in support of the Bennett Cancer Center! We’ve partnered with the Bloomin' Metric to give cycling enthusiasts the opportunity to participate in a beautiful ride while supporting patients at the Bennett Cancer Center. Just like our other Hope in Motion events, any donation you make to Hope in Motion through your ride goes directly to fund quality-of-life services, free-of-charge, for the Bennett Cancer Center patients and their families. These services include exercise and nutrition programs, integrative medicine like yoga, massage, and Reiki, and survivorship programs. The Bloomin' Metric is a beautiful ride through Westport, beginning at Sherwood Island State Park and going through Fairfield and other Connecticut towns. You can choose from three routes: a 40-, 75-, or 100-kilometer option. The 2018 Bloomin' Metric registration is now open. 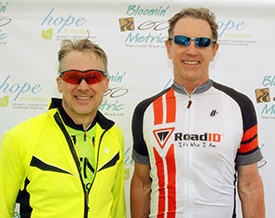 To participate in the ride, you will need to register through the Bloomin' Metric site. The registration fees cover the ride and commemorative t-shirt. 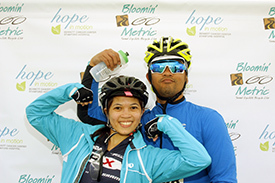 Please note that any donation to Hope in Motion will need to be in addition to the registration fee—you can make this donation while registering for the ride on the Bloomin' Metric site. Please note: there is a ride maximum of 2600 and there is NO day of registration. 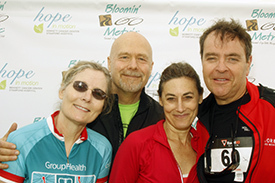 You can start a team, join a team, or fundraise as an individual through the Hope in Motion website for no additional fee. All you have to do is click here and follow the prompts. Under Participation Type, you will check the box that says "Virtual Fundraising Sign-up.“ Once you have entered all of your information, you can go on to create your fundraising webpage and kickoff your fundraising!